I often joke with school kids that Odin looks like a pirate Santa. (You may already know that similarities between depictions of Odin and Santa are not coincidental). Anyway, that running joke led to the drawing above. There could be a story in it; who knows? On behalf of Fremantle Press, Norman and myself, I want to say thank you for your amazing support since the release of The Last Viking. Can you believe that was 2 and a half years ago?? And it’s now only 10 months until The Last Viking Returns!? 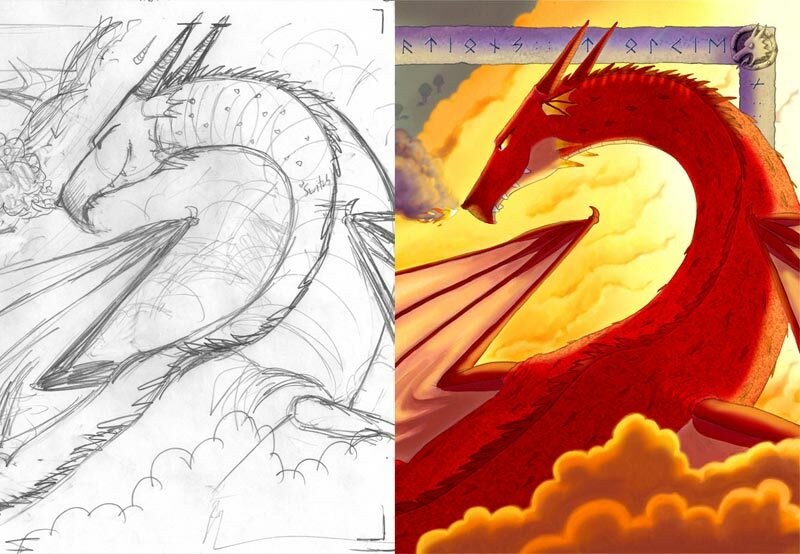 Right now I’m working on final illustrations, but I’ll have more time for behind-the-scenes posts in 2014. Stay tuned. And Merry Christmas! 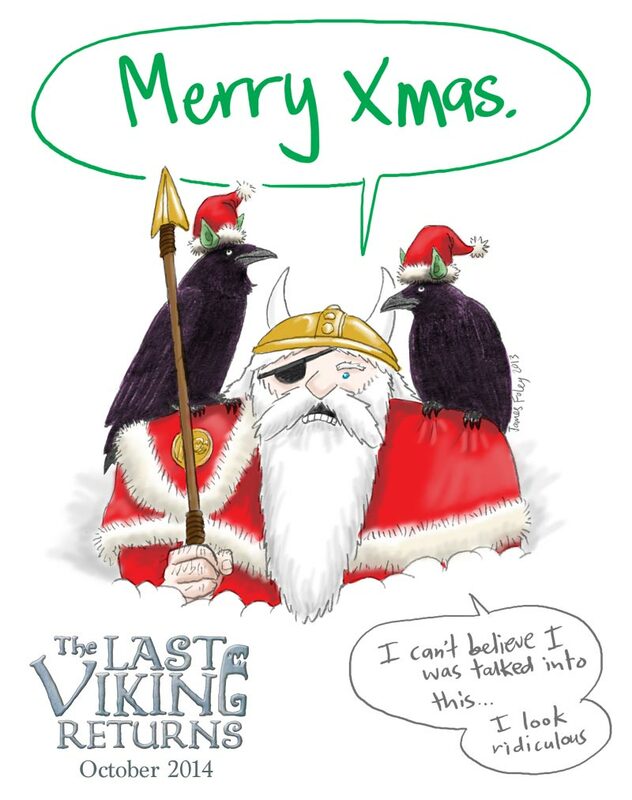 Categories: The Last Viking 2 | Tags: Father Christmas, Huginn, Muninn, Odin, Santa Claus, Viking | Permalink. Actually, it was. Norm and I had been watching the weather forecast all week, wondering what the heavens would bring on the Friday night of our launch. By Tyr’s Day, we could see that rain was likely. By Wodin’s Day, rain was certain. Come Freyja’s Day, when the wind didn’t let up all day, we knew a storm was brewing. Thor was angry. The joke going around was that his invite had been lost on it’s way to Asgard. But maybe that was true, and he thought we were snubbing him… and when you snub a Norse god, you get a once-in-10-years weather event. Thirty millimetres of rain fell in 30 minutes- the precise 30 minutes in which our guests were en route to the launch. 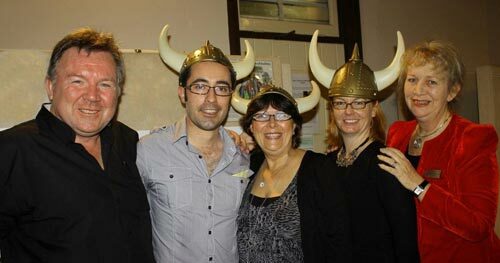 Categories: events | Tags: book launch, Fremantle Children's Literature Centre, Fremantle Press, Grey Company, James Foley, Norman Jorgensen, Odin, The Last Viking, Thor | Permalink. There’s only four weeks to go until the launch! So here’s four sneak peeks to celebrate. and Odin, Thor and the Bezerkers preparing for battle. My favourite part of this last image is the bottom right-hand corner. I put in a bird poo for a joke. At the time I didn’t realise that when people were going to turn this page, that’s exactly where they would have to put their thumb. Categories: final artwork | Tags: berzerker, Funeral, Odin, sneak peek, Thor, Viking | Permalink.